Astronomers celebrate Neptune's Birthday! | Pleasant's Personal Blog! Galileo observed Neptune on December 28, 1612 and again on January 27, 1613 and recorded the findings in his drawings. However, he is not credited with the discovery of the planet since he mistook Neptune as a distant star that appeared in conjunction with Jupiter. Neptune had turned retrograde on the day when Galileo discovered it, however, according to physicist David Jamieson, Galileo was at least aware that the “star” he discovered moved relative to the fixed starts. Substantial deviations from astronomical tables of Uranus’s orbit published in 1821 by French astronomer Alexis Bouvard was subsequently observed leading him to hypothesise that an unknown body was perturbing the orbit of Uranus through gravitational interaction. 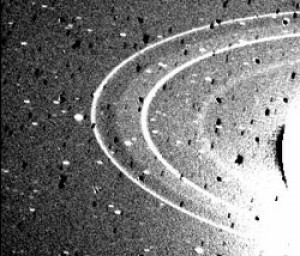 British astronomer John Couch Adams in 1843, began work on Uranus’s orbit using the data sent to him by the then Astronomer Royal Sir George Airy through James Challis, the then Cambridge Observatory director. His mathematical work through 1845-46 produced several estimates of the existence a new planet. During the same period, French astronomer Urbain Le Verrier independently developed his own calculations about the new planet but did not stimulate enthusiasm in his fellow astronomers. In June 1846, Sir George Airy, upon seeing the similarity of Le Verrier’s first published estimate of the planet’s longitude to that of Adams’s estimate, Airy persuaded James Challis to search for the planet though the search that lasted throughout August and September of that year did not produce any results. Meanwhile, a letter was sent to the German astronomer Johann Gottfried Galle of Berlin Observatory by Le Verrier requesting him to search for the new planet using the observatory’s refractor. A student at the observatory, Heinrich d’Arrest suggested to Galle that they might be able to make the discovery if they compared the chart drawn about the region predicted by Le Verrier and with the current sky to seek the displacement characteristic of the planet as opposed to a fixed star. It worked and that very evening on September 23, 1846, Neptune was discovered within 1° of where Le Verrier had predicted and about 12° from Adams’ prediction. James Challis later realised that he did observe the planet twice in August but failed to identify it due to his casual approach to the work. There have been much debate between France and Great Britain as to who should get the credit of the discovery of the planet. However, it was decided through international consensus that both Adams and Le Verrier should be credited equally even though to this day there are people who do not credit Adams with the discovery. Neptune is 2.8 billion miles from the Sun which is about 30 times farther than Earth making it slow and freezing cold. 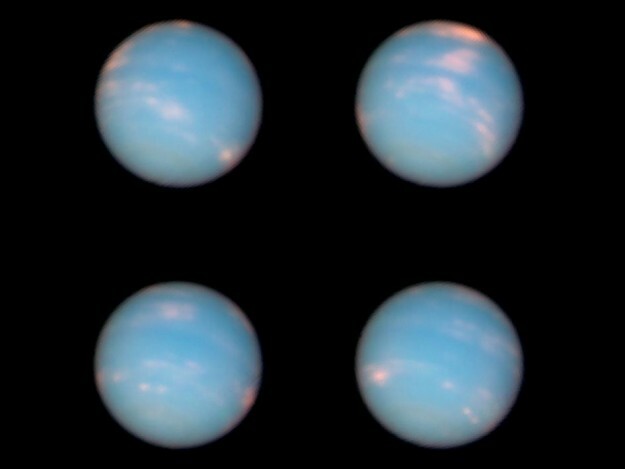 The image shows the planet in four hour intervals within Neptune’s 16-hour day. The white fluffy streaks are clouds, but not of the Earth variety. Due to the low ambient temperature of the planet, they are high-altitude swaths of frozen methane. Neptune has a 29-degree tilt, which, like Earth’s tilt of 23-degrees, causes the planet to experience seasons. Currently Neptune is experiencing summer in the southern hemisphere and winter in the north. While a season lasts only a few months on Earth, it lasts up to 40 years on Neptune. Planetary scientist Dr. Craig O’Neil of Macquarie University says that we still haven’t learned much about Neptune since its discovery. “It’s location at the edge of the solar system makes it a bit of a black hole from a knowledge point of view,” he says. According to him, the huge distance from the sun makes sun look like a point of light in Neptune no brighter than Venus does from Earth. 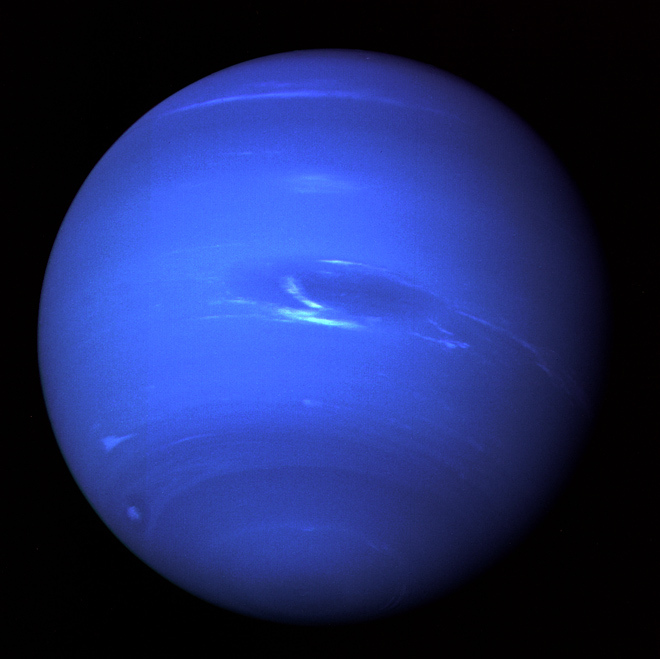 Most of what we know about Neptune today comes from Voyager 2’s fly-by of the planet in 1989 and the Hubble Space Telescope. 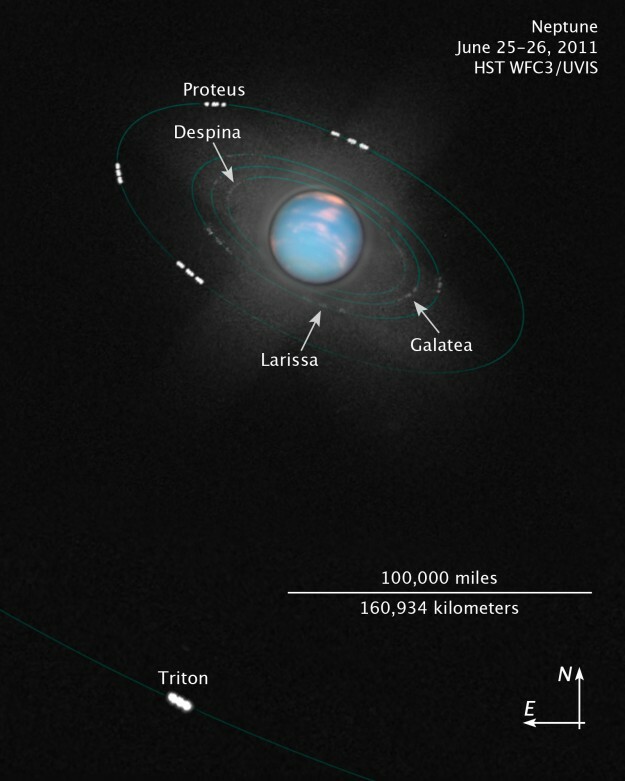 Neptune does have a planetary ring system, though it is less substantial than that of Saturn. The rings may consist of ice particles coated with silicates or carbon-based material giving them a reddish hue. The three main rings are the narrow Adams Ring, 63000 km from the centre of Neptune, the Le Verrier Ring, at 53000 km, and the broader, fainter Galle Ring, at 42000 km. A faint outward extension to the Le Verrier Ring has been named Lassell; it is bounded at its outer edge by the Arago Ring at 57000 km. Observations show that the rings are more unstable than previously thought. Images taken from the W. M. Keck Observatory in 2002 and 2003 show considerable decay in the rings compared to images by Voyager 2. Most of the atmosphere of Neptune is made of hydrogen, helium and methane. The blue colour supposedly comes from methane absorbing red light. However, Uranus, that has a similar atmosphere is cyan in colour. Scientists are still speculating about the supersonic winds of Neptune which are the fastest in the Solar System since their speed of 2,000 kilometres per hour do not conform to the large distance from the sun. “The Sun can’t be powering what’s happening there. Given Uranus has fairly mild winds, Neptune’s dynamics are a mystery. One idea is that if you put methane under enough pressure deep in Neptune’s atmosphere, it could convert to diamond which would fall as rain. This conversion process releases heat which could power the winds. That’s a little more speculative, but speculation is all we’ve got, ” says Dr. O’Neil. Shown above is a composite image of Hubble shots stitched together by NASA. You can see multiple moons within the same orbit due to the time lapse between shots. In order to get the true hue of Neptune’s atmosphere, NASA took numerous photos with three different colour filters. Over 30 moons have been discovered orbiting Neptune but the majority orbit farther away to fit into this shot. Written by: Pleasant on July 14, 2011.on June 22, 2014.